Red Crescent Youth Group arranged a blood camp in collaboration with Fatimid Foundation on 2 and 3 March in Sinclair Hall from 10:00 am to 4:00 pm . The students actively participated in collection of 134 bottles of blood for Thalassemia patients. Many faculty members also contributed to the donation. 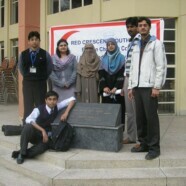 Red Crescent office bearers worked with great dedication towards the cause and were proud of the successful outcome. They hope that more people come forward to not only donate but to arrange such activities in college.